If you would like for me to add a specific function, please contact me and let me know. This is the free fully functioning Lite version that is an EXE which does not require an installation package on the server. You can just run this EXE on the server without having to install anything. Add it to your startup folder to have it automatically start when Windows starts. 03-29-2013 This version installer was updated to address an issue where the server app would use high level of CPU. This was caused by a loop in code that would constantly ping the devices to report it was alive. 6. Start the MCE Remote application on your iPhone/iPod or iPad... Click the bottom rightmost button / question mark / and select your method to connect to the server (IP Address or Bonjour) If you choose 'Bonjour', you will see the servers list of available servers. 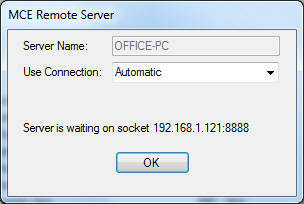 If you select 'IP Address' enter the IP of the MCE PC running the server. Note: When MCE Remote Server first starts for the first time on your computer, a message will be displayed asking if you would like to allow access. Choose yes to allow access. I will be adding support for other camera manufacturers.